Nearly 20 years ago the Fear Avoidance Model (FAM) was advanced to explain the development and persistence of disabling low back pain. The model has since inspired productive research and has become the leading paradigm for understanding disability associated with musculoskeletal pain conditions. The model has also undergone recent expansion by addressing learning, motivation and self-regulation theory [10, 34]. In contrast to these extensions, however, one relatively constant aspect of the model is the recursive series of fear-related cognitive, affective, and behavioral processes shown in Figure 1 [31, 32, 34]. Despite the endurance and popularity of these cyclical relationships their level of empirical support remains unclear. For instance, recent prospective studies have failed to support the proposed sequential relationships between psychological risk factors [5, 36]. Also, the validity of several fundamental assumptions that underlie these cyclical relationships has yet to be fully examined, including the characterization of fear as phobia, the inextricable link between pain and disability, and the independence of disability from pain-related physiological processes. As the FAM continues to evolve, it is critical to clarify whether its cyclical relationships should be retained. The purpose of this topical review is to evaluate the empirical support and theoretical assumptions of the FAM’s cyclical relationships and to highlight implications for future theoretical advancement. 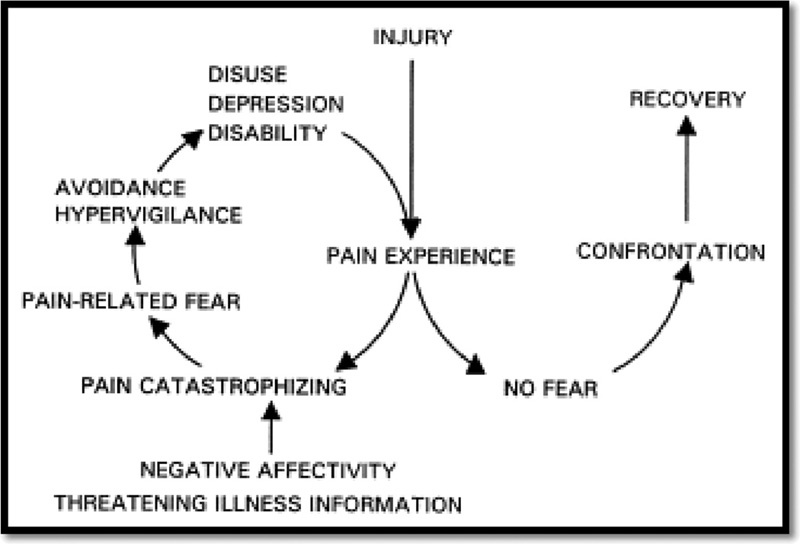 A key component of the FAM cycle is the prospective, sequential inter-relationships between catastrophizing, fear, depression, and pain-related disability, and the role of fear as a common conduit for recovery. Several studies have shown broad support for the FAM using cross-sectional or longitudinal analyses [18, 28]. However, particular prospective study designs are needed to confirm the sequence and direction of relationships proposed in Figure 1 . Two recent studies using a three-panel, prospective design failed to show that changes in pain catastrophizing precede changes in pain-related fear or that changes in fear precede changes in depression [5, 36]. Three recent longitudinal studies have also examined whether pain-related fear acts as a common predictor of both pain intensity and pain-related disability [13, 27, 39]. Fear uniquely predicted disability in one study  and failed to prospectively predict pain in all studies [13, 27, 39]. Contrary to model predictions, pain catastrophizing had direct and independent relationships with pain (even after controlling for fear), and pain intensity emerged as a predictor of disability even after controlling for model-relevant risk factors [27, 39]. Disuse Syndrome, the proposed downstream mechanism through which fear and avoidance influence disability, is another important link in the FAM cycle. Disuse syndrome is a broadly conceived, adverse condition resulting from prolonged physical inactivity . FAM proponents have focused on the effects of disuse on musculoskeletal and cardiovascular systems [31–33], suggesting that physical deconditioning and disability are caused by fear-driven inactivity. Previous work, however, has shown inconsistent links between inactivity or deconditioning among individuals with chronic pain relative to pain-free control groups [24, 29]. Furthermore, though pain-related fear is closely linked to avoidance of specific pain-related behaviors , this risk factor is not consistently related to objective measures of general disuse or physical fitness in either prospective or cross-sectional studies [7, 19, 22]. Collectively, these findings suggest that avoidance of specific feared movements does not translate into widespread inactivity, and that fear is unlikely to influence disability through the proposed disuse syndrome mechanism. While the FAM emphasizes cyclical relationships between its risk factors (catastrophizing, fear, depression), recent findings support cumulative interactions. For example, patients with elevated scores on a greater number of risk factors (i.e. those with a higher cumulative risk load) are more likely to develop prolonged pain and disability [35, 38]. The clinical value of this approach is highlighted by findings that a single measure of cumulative risk load shows greater predictive strength and scope than combined severity measures of catastrophizing, fear and depression . Additionally, stratifying clinical interventions based on cumulative risk leads to improved outcome and reduced treatment cost . While the cyclical relationships of the FAM offer appealingly specific clinical implications (e.g. treating catastrophizing before fear), model-relevant interventions fail to meet this level of specificity  and increasing evidence suggests that cumulative risk load may be a more important target of treatment. with elevated pain-related fear [18, 31–33]. There are grounds for questioning the relevance of a phobia-based conceptualization of fear for individuals with persistent musculoskeletal pain . For instance, individuals with chronic pain often don’t view their fear as excessive or unreasonable  and fail to show phobia-related brain activation patterns when exposed to feared stimuli . Pain-related fear also doesn’t appear to disrupt activity levels, metabolic rates, or functional capabilities [7, 30] to the levels found among individuals with phobic disorders. These findings are consistent with research suggesting that graded exposure interventions can have modest effects on disability , which may result from targeting phobia-related processes not always applicable among individuals with pain conditions. Despite the limited relevancy of how pain-related fear is conceptualized, there is clear predictive value to its evaluation. This apparent contradiction may be explained by a discrepancy between the FAM conceptualization of pain-related fear and its current measurement . At odds with characterizing pain-related fear as phobia, questionnaires commonly associated with the FAM (e.g. Tampa Scale of Kinesiophobia, Fear Avoidance Beliefs Questionnaire) focus on pain-related beliefs and expectations while neglecting crucial attributes of phobic disorders like negative affect or distress-related behavior. Empirical evidence may therefore lend support for measures associated with pain-related fear, while failing to support how they are conceptualized. A second assumption relates to the inextricable link between chronic pain and prolonged pain-related disability. The FAM proposes two polar trajectories that lead to either elevated levels of, or recovery from, both pain and disability; the presence of psychological risk factors determines the path charted. Contrary to prediction, findings suggest that many individuals with chronic pain don’t report significant levels of catastrophizing, fear or disability [2, 15]. While the FAM is unable to account for this cohort, recent research exploring resilience factors may help explain their existence. Resiliency research focuses on how individuals can successfully adapt to adverse stimuli or situations, such as persistent pain . While resilience factors have been linked to risk factors in the FAM , previous research suggests that these constructs do not represent two sides of the same coin. For instance, 39% of people with chronic arthritis have either high or low levels of both resilience and risk factors . High levels of resilience factors also appear to buffer the negative impact of pain [26, 40]. Consequently, consideration of both risk and resilience factors may help explain how individuals can live with chronic pain without concurrently experiencing disability. A third FAM assumption is that pain-related sensory and physiological processes are important to acute pain, but play a limited role in perpetuating long-term pain and disability, which are maintained solely by cognitive-behavioral factors. Consistent with Fordyce’s principles of avoidance learning , the FAM suggests that in chronic cases, disability is independent from organic pathology, nociceptive processes, and pain intensity [31, 33]. This is at odds with a range of empirical findings. Contrary to FAM predictions, pain intensity is a robust and unique predictor of disability [27, 39], and maladaptive changes in sensory processing have been linked to the development and persistence of disabling musculoskeletal pain conditions . Also, a growing body of research suggests close, bi-directional relationships between biological and cognitive-behavioral processes. For instance, psychological factors have been shown to have genetic links, to be triggers of inflammatory and endocrine processes, and to be related to the structure and function of the central nervous system [9, 11]. These findings suggest that addressing these bi-directional relationships between cognitive-behavioral and biological processes may yield a more comprehensive picture of pain-related disability. The extant literature suggests that it is time to move on from certain aspects of the FAM. First, we recommend the rejection of the cyclical relationships proposed in Figure 1. While the predictive influence of FAM risk factors is well established, it is unlikely that these factors relate to one another through the simplistic pathway proposed. Second, we recommend shifting the conceptualization of pain-related fear away from phobia and that questionnaires related to pain-related fear should be conceptualized in accordance to their measurement qualities. Recent literature has begun to address these issues by highlighting the importance of goals unrelated to fear and by focusing on behavioral correlates of fear and avoidance instead of self-report questionnaires [10, 34]. The discordance between measures and constructs within the FAM literature may be partly due to an over-reliance on a small set of self-report questionnaires. Recent research using behavioral measures (e.g. learned movements) sheds light on important mechanisms that may underlie the acquisition of avoidance behaviors [10, 34]. Future research in this area might explore and validate the use of such measures in clinical settings. Third, multiple pathways related to the development and persistence of pain-related disability should be considered. Pathways centered on the threat-value of pain should be contextualized within a broader range of disability-related processes, such as both positive and negative psychological factors as well as pain-related physiological processes. Deconstructing and re-framing the cyclical FAM in this manner is broadly consistent with recent research linking different activity patterns to pain-related disability. While recent FAM extensions endorse the single fear avoidance pathway [10, 34], paradoxically, their theoretical underpinnings suggest that a range of behaviors may lead to disability. Learning paradigms suggest that avoidance can occur both in the presence and absence of feared stimuli ; indeed, physical activity may be avoided (without signs of distress ) due to its anticipated discomfort or perceived effort. Similarly, self-regulation theory suggests that declines in physical activity can occur as a result of both avoidance and approach behavior wherein individuals may approach sedentary activities due to their relatively high appetitive value compared to more arduous physical activities. Other research has linked persistence and pacing activity patterns to levels of disability . It is likely that individuals living with pain use a variety of activity patterns in a dynamic and context specific manner and that avoidance of feared movements represents only one subset of these patterns. Moving on from the cyclical relationships shown in Figure 1 may help integrate important FAM constructs within a more comprehensive characterization of pain-related disability. For nearly two decades the FAM has served as a leading explanatory framework for pain-related disability. While this model has played a crucial historic role in establishing the importance of cognitive-behavioral risk factors, a more comprehensive framework is needed to address the range of processes known to contribute to pain-related disability. In addition to the different resilience, physiological and behavioral processes addressed above, research has established the influence of social, cultural and environmental factors in shaping disability; however, there is currently no overarching theoretical framework to address how multi-dimensional processes interact, change over time and influence pain-related disability. Developing such a framework will help integrate our understanding of pain-related disability with current conceptualizations of pain and the World Health Organization’s classification of disability, which both incorporate a full range of biopsychosocial processes. Such a framework may also inform novel avenues for research and clinical practice, such as exploring the cumulative impact of multi-dimensional risk constructs and multi-modal interventions for disability reduction. Though space limitations preclude the development and promulgation of such a multi-dimensional framework here, we hope to take a collaborative, cross-disciplinary approach to addressing this critically important construct in the future. This research was supported by funds from the Canadian Institutes for Health Research (CIHR), the Fonds de Recherche Santé Québec (FRSQ) and the Institut de recherche Robert-Sauvé en santé et en securité du travail (IRSST). A portion of this manuscript was included in the doctoral thesis of the primary author. Special thanks to Terence Coderre, Richard Koestner, Jeff Mogil and Petra Schweinhardt for serving on the thesis review committee and to Johan Vlaeyen for insightful discussions about this field of research. Apkarian AV, Baliki MN, Geha PY. Towards a theory of chronic pain. Progress in neurobiology. Asmundson GJ, Norton GR, Allerdings MD. Fear and avoidance in dysfunctional chronic back pain patients. Asmundson GJ, Parkerson HA, Petter M, Noel M.
What is the role of fear and escape/avoidance in chronic pain? Models, structural analysis and future directions. Barke A, Baudewig J, Schmidt-Samoa C, Dechent P, Kröner-Herwig B.
Neural correlates of fear of movement in high and low fear-avoidant chronic low back pain patients: An event-related fMRI study. Bergbom S, Boersma K, Linton SJ. Both early and late changes in psychological variables relate to treatment outcome for musculoskeletal pain patients at risk for disability. Bousema EJ, Verbunt JA, Seelen HAM, Vlaeyen JWS, Knottnerus JA. Disuse and physical deconditioning in the first year after the onset of back pain. Cde C, Williams A, McCracken L.
Cognitive-behavioral therapy for chronic pain: An overview with specific reference to fear and avoidance. In: Asmundson GJ, Vlaeyen J, Crombez G, editors. Understanding and treating fear of pain. Toronto: Oxford University Press; 2004. Mind-body interactions in pain: the neurophysiology of anxious and catastrophic pain-related thoughts. Crombez G, Eccleston C, Van Damme S, Vlaeyen JWS, Karoly P.
Edwards RR, Calahan C, Mensing G, Smith M, Haythornthwaite JA. Behavioral Methods for Chronic Pain and Illness. Saint Louis: The C. V. Mosby Company; 1976. Gheldof ELM, Crombez G, Van den Bussche E, Vinck J, Van Nieuwenhuyse A, Moens G, Mairiaux P, Vlaeyen JWS. Pain-related fear predicts disability, but not pain severity: A path analytic approach of the fear-avoidance model. Hill JC, Whitehurst DG, Lewis M, Bryan S, Dunn KM, Foster NE, Konstantinou K, Main CJ, Mason E, Somerville S, Sowden G, Vohora K, Hay EM. Kindermans HPJ, Roelofs J, Goossens MEJB, Huijnen IPJ, Verbunt JA, Vlaeyen JWS. Activity patterns in chronic pain: underlying dimensions and associations with disability and depressed mood. Kronshage U, Kroener-Herwig B, Pfingsten M.
Kinesiophobia in chronic low back pain patients—does the startle paradigm support the hypothesis? International journal of behavioral medicine. 2001;8(4):304–318. Leeuw M, Goossens MEJB, Linton SJ, Crombez G, Boersma K, Vlaeyen JWS. Leonhardt C, Lehr D, Chenot J-F, Keller S, Luckmann J, Basler H-D, Baum E, Donner-Banzhoff N, Pfingsten M, Hildebrandt J, Kochen MM, Becker A. Are fear-avoidance beliefs in low back pain patients a risk factor for low physical activity or vice versa? A cross-lagged panel analysis. Lundberg M, Grimby-Ekman A, Verbunt J, Simmonds MJ. Pincus T, Smeets RJEM, Simmonds MJ, Sullivan MJL. The fear avoidance model disentangled: improving the clinical utility of the fear avoidance model. Smeets RJ, van Geel KD, Verbunt JA. Is the fear avoidance model associated with the reduced level of aerobic fitness in patients with chronic low back pain? Smeets RJEM, Vlaeyen JWS, Kester ADM, Knottnerus JA. Reduction of pain catastrophizing mediates the outcome of both physical and cognitive-behavioral treatment in chronic low back pain. Smeets RJEM, Wade D, Hidding A, Van Leeuwen PJCM, Vlaeyen JWS, Knottnerus JA. The association of physical deconditioning and chronic low back pain: a hypothesis-oriented systematic review. Vulnerability and resilience in women with arthritis: test of a two-factor model. Resilience: a new paradigm for adaptation to chronic pain. Sullivan M, Tanzer M, Stanish W, Fallaha M, Keefe FJ, Simmonds M, Dunbar M.
Psychological determinants of problematic outcomes following Total Knee Arthroplasty. Turner JA, Franklin G, Fulton-Kehoe D, Sheppard L, Wickizer TM, Wu R, Gluck JV, Egan K.
Verbunt JA, Smeets RJ, Wittink HM. Cause or effect? Deconditioning and chronic low back pain. Verbunt JA, Westerterp KR, van der Heijden GJ, Seelen HA, Vlaeyen JW, Knottnerus JA. Physical activity in daily life in patients with chronic low back pain. Vlaeyen JWS, Kole-Snijders AM, Rotteveel AM, Ruesink R, Heuts PH. The role of fear of movement/(re) injury in pain disability. Fear-avoidance model of chronic musculoskeletal pain: 12 years on. Westman AE, Boersma K, Leppert J, Linton SJ. Fear-avoidance beliefs, catastrophizing, and distress: a longitudinal subgroup analysis on patients with musculoskeletal pain. Wideman TH, Adams H, Sullivan M.
A prospective sequential analysis of the fear-avoidance model of pain. Wideman TH, Hill JC, Main CJ, Lewis M, Sullivan MJ, Hay EM. Comparing the responsiveness of a brief, multidimensional risk screening tool for back pain to its unidimensional reference standards: the whole is greater than the sum of its parts. Development of a cumulative psychosocial factor index for problematic recovery following work-related musculoskeletal injuries. Differential predictors of the long-term levels of pain intensity, work disability, healthcare use medication use in a sample of workers' compensation claimants. Zautra AJ, Johnson LM, Davis MC. Positive affect as a source of resilience for women in chronic pain.